I'm getting back in the habit of including more Squeaky Wheel updates and remembered one from a few months before we left Harlem involving BJs. We purchased our BJs membership last March starting with a trial membership we saw over on Prissy Mommy. We didn't jump right in to purchase a full membership, but did calculations and determined that we'd indeed save money by purchasing certain items in bulk and continuing to get other items at the traditional grocery store. 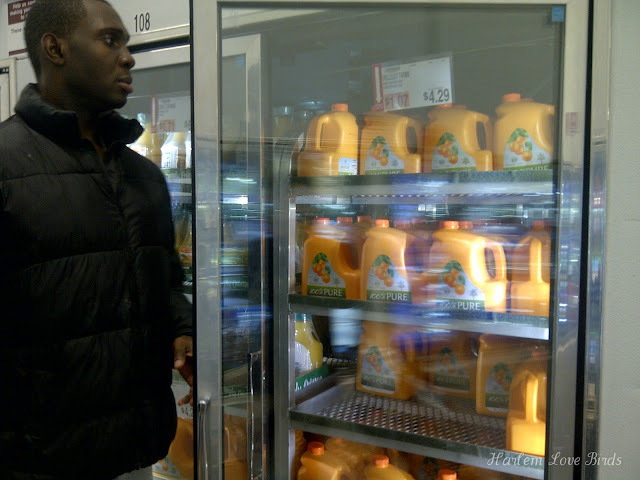 One of the items we determined we could save on by purchasing in bulk was orange juice. Now this doesn't sound like a big deal but growing up both me and Mr. Love Bird came from households where juice was GOLDEN! You were only allowed specific quantities and usually only with Sunday morning breakfast. Even today when I pour a correct serving of 8oz of orange juice in front of my mom she will reprimand, "You know that's 2 servings of juice???" Seriously. So one of the perks of leaving home for me as an adult was being the master of my own juice (and being able to buy white bread, but that's another blog post for another day!). Back to the squeaky wheel . . .
We noticed after the first couple times of shopping at BJs that they were out of their store brand orange juice, Wellesley Farms, which tastes so good and is substantially less than Tropicana. We started noticing no matter what day or time we did our monthly BJs shopping that they would be out of orange juice. OJ's a pretty basic item so I finally decided to do something about it . . . I wrote to the company! I promptly got a call from HQ and explained the situation. They investigated, gave me the SKU # and advised I call ahead to make sure they have it in stock. Well on the next trip I called within 1 hour of our arrival, gave the SKU # and was assured there was juice on the shelves, but when we showed up there was no juice! ARGHHH! I contacted HQ again to let them know, they investigated again then informed me there was an error in the computer making it seem like OJ was in stock when it actually wasn't. AHA! I knew there was something fishy going on! I know it sounds corny, but I was so proud of how my persistence paid off to have OJ in stock for the masses who shop at BJs! I wanted to post a picture of myself on the door and write: "Courtesy of Quiana." Is there an item at your store that's always outta stock? Say something!